A 12th-century church in the centre of historic Gloucester. St Nicholas' was rebuilt in the 13th century and the wonderful west tower was added in the mid 15th century. The tower is a real local landmark with its distinctive spire. 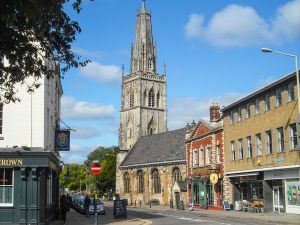 The spire was hit by cannon fire in the Civil War siege of Gloucester in 1643, and it was lowered and topped with a lead cap in 1783 to produce the current oddly truncated look. The church was first recorded in 1180 and stood near the old west gates of the city (now vanished). It was known as 'St Nicholas of the bridge of Gloucester', and belonged to the crown, which suggests that it was founded by a monarch. It seems that existing Saxon burgage plots were cleared to make room for the church, which explains why it appears cramped for space and so well aligned with the street frontage. The churchyard behind the church itself perfectly aligns with the boundaries of earlier Saxon burgage plots. It probably sprung up at the same time as Westgate Bridge was erected, around 1119, to serve the growing population of Gloucester. In 1229 the church was given to St Bartholomew's Hospital, and church and hospital maintained a close relationship throughout the medieval period. It was later granted to the City Corporation (essentially the city government) and until 1870 the Corporation of Gloucester had the living. You enter through the north door, which still has its original Norman tympanum, depicting the Agnus Dei (lamb of God). The interior is a reminder of Gloucester's prosperous past, with glorious vaulting in the tower, and a plethora of historic funerary monuments to prominent city merchants. During the medieval period, several chantries were established within the church, including one to Thomas of Canterbury and another to St Mary. In addition, there were three side altars, so you can get the idea that this was a very busy, very prosperous church, perfectly in tune with Gloucester's prosperity during the medieval period from the wool and shipping trades. The most impressive tomb is that of John Walton (d. 1626), a goldsmith, former city alderman, and Sheriff of Gloucester, whose elaborate memorial is in the Chantry Chapel of St Mary. Walton wears his red robes of office while his wife Alice has a marvellous broad-rimmed hat. There are squints on both sides of the chancel arch, allowing the congregation to view the high altar from the sides of the nave. These had to be inserted in the 16th century when St Nicholas church became extremely popular and was crowded during services. One unusual feature is that the church leans at a very noticeable angle. Perhaps the best place to appreciate the awkward angle at which the building finds itself is simple to stand at one end of the nave and look straight ahead. There is one ancient treasure that you cannot find at St Nicholas; that is the 14th-century sanctuary knocker that once adorned the south door. This large knocker was made of brass and depicted the head and part of the body of an odd serpent-like creature with the head of an old woman on its back. The sanctuary knocker is on display in the City Museum. 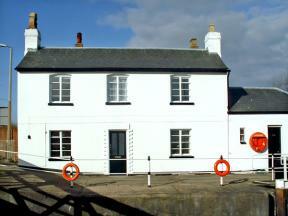 St Nicholas church is no longer in regular use and is cared for by the Churches Conservation Trust. It is usually open daylight hours. Location: At the lower end of Westgate Street, near the cathedral. Opposite the museum and 250 metres from the ring road.